Can Liberal Zionism Survive Israel’s New Travel Ban? Israel’s new anti-BDS law is antagonizing some of the state’s most loyal supporters, rewriting a decades-old relationship. 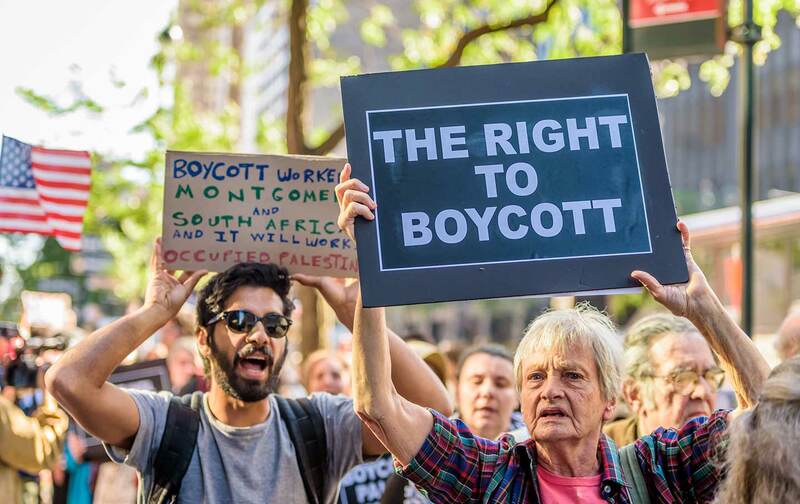 Israel ramped up its fight against the global boycott movement last week, when the Knesset passed its own travel ban—a new law barring entry to any noncitizen or non–permanent resident who has publicly called for a boycott of Israel. While it has yet to be seen how the law will be implemented, the language applies broadly to any person, organization, or body that has called for a boycott of Israel in any public media or has “committed to participate in such a boycott.” Although the law appears primarily to be targeting foreign nationals who seek to enter the West Bank (which requires approval by Israeli border officials), it is likely to have the most direct effect on Palestinians living in the West Bank and Gaza who seek to enter Israel for a variety of personal and humanitarian reasons. The law is essentially an extension of a 2011 anti-boycott law, which seeks to penalize Israelis who try to oppose the occupation by refusing to buy products made in the settlements or to attend cultural or academic events in the settlements. As with that law, this new one not only targets people who call for a boycott that applies to all of Israel but also to those who call for a boycott targeted solely at the settlements, which are considered illegal under international law. By making no distinction between someone who opposes the post-1967 configuration of Israel and someone who challenges the framework of the state that was created in 1948, the Israeli government is lumping together progressive Zionists, non-Zionists, and anti-Zionists. Israel has itself been doing this for a long time internally by implementing policies that erase the Green Line and that discriminate against Palestinians regardless of whether they live in a Bedouin village inside Israel or a Palestinian village inside the West Bank, as well as by trying to limit the activities of Israeli human-rights activists. The difference with this law is that now Israel is turning this approach outward as part of its foreign policy. How this new approach will play out politically—whether it will energize the BDS movement or scare off potential supporters—remains to be seen. But of one shift there is little doubt: The new law will necessarily redefine relations with diaspora Jews. By reconfiguring alliances based not on whether a person is Jewish but on whether a person is sufficiently “pro-Israel”—which Israel has made clear means being pro-settlement, pro-Occupation, and anti-Palestinian—Israel has indicated that it is no longer interested in the ingathering of Jews simply because they are Jewish. What matters is whether a person toes the government line, regardless of whether they are Jewish or not. While the new law sent shock waves throughout the diaspora community, one group that has been particularly rattled are American liberals, and specifically American Jewish liberals. These are men and women who strongly oppose settlements and occupation while remaining loyal to the faded possibility of Israel as Jewish and democratic state; who have continued to promote the idea of a two-state solution with vigor even as Israel has undermined and renounced it. They are people who condemn the BDS movement, often stridently, even as some have come to advocate for a modified, settlement-based boycott. And they are people who time and again have gone to bat for Israel even as it has spat in their faces. In short, they are some of the most invested and engaged Israel supporters, true believers who grapple with it and are critical of it because they care. Now, with this law, Israel is pushing them into a corner where they must choose once and for all which side they are on: the side of universal values and human rights, or the side of Jewish nationalism, perennial military occupation, and inequality. In some ways, this new anti-boycott law takes us back to that landmark moment and redefines the agreement by freeing American Jews of any expectations. Israel is sending the message that it in fact does not want or need American Jewish involvement if that involvement takes the form of pitched criticism or dissent, and that the cultural or historical connection is just not that important to them. Now that there is a robust pro-Israel base in the United States comprised of Islamophobic Republicans, messianic Christian Evangelicals, and right-wing Jews who unconditionally support Israel, the government no longer feels the need to deal with critical American liberal Jews. Most Americans—not just Jewish ones—have over the decades supported Israel on the basis that it provided a safe haven for Jews following the centuries of anti-Semitism that culminated in the Holocaust. But in practice, Israel’s policies of dispossession and discrimination have long overshadowed its raison d’être, creating increasing dissonance with American “pro-Israel” liberals. In the face of its diminishing legitimacy, Israel has gone on the offensive by attacking the legitimacy of criticism and dissent. It has been doing so for years by attempting to quash Palestinian nonviolent resistance and, more recently, by silencing Israeli human-rights activists and organizations. Now it is turning this policy outwards against its greatest allies abroad. It has made clear that being pro-Israel has nothing to do with being Jewish, or liberal, or supporting democratic values, human rights, or critical thinking. By trying to fend off criticism of its democratic infractions, it has doubled down its anti-democratic policies, declaring war on American liberals and, specifically when it comes to the Jewish community, turning Israel’s greatest allies into its greatest nemeses.